During an hour-long discussion with author Dave Eggers at the Obama Foundation Summit in Chicago, former President Obama opined on ways to mobilize Americans toward creating social change. While the entire session was a thinly-veiled attack on the current administration (and anyone who voted for it), as Grabien's Tom Elliott notes, when the topic of global warming came up, Obama’s criticism was particularly pointed. "...the reason we don't [invest in climate change policies] is because we are still confused, blind, shrouded with hate, anger, racism - mommy issues..."
“And — and so if that’s the case then the single most important thing that we have to invest in is not all — and look I’m a huge supporter of science and technological research and social science and, you know, evidence-based learning and all that good stuff. I’m — I’m — people call me Spock for a reason, I believe in reason and logic and all these enlightenment values, but the thing that really we have to invest in is people. We got to get people to figure out how they work together — in a — you know, how do we get people to work together in a cooperative, thoughtful, constructive way." 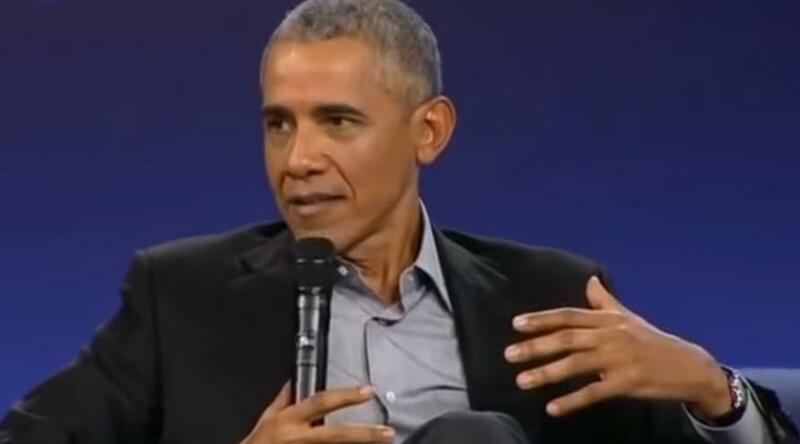 “I was having a conversation with a friend, who was depressed about the current course of our country — it’s a conversation that happens a lot,” Obama said later. “This is a heavy burden,” he said. And in another dig at Trump on Monday, Obama suggested the US was a better place before he was sworn into office. Obama repeated his belief that if you could choose a time and place to be born, you would choose the US.